There is an ironic and costly contradiction in the attempt to integrate technology into education. While evidence of the educational benefits of technology abounds and investment in hardware and software has dramatically increased, rela-tively few teachers use technology regularly in their teaching and the impact of computers on existing curricula is still very limited. What lies behind this contradiction? Why don't teachers make wider use of instructional technologies? In this article we introduce a novel model of goal-oriented behavior, Perceptual Control Theory (PCT), as a framework for understanding teacher adoption of technology. Unlike other approaches that examine this issue by studying the ex-ternal environment, this new framework attempts to under-stand teacher adoption of technology from the inside. It con-siders teachers' use of technology by examining the goals of teachers and how the use of technology might help or hinder their goals. While it is too early to provide systematic find-ings to show the usefulness of this application of PCT, we have used it here to interpret and synthesize the findings of a number of studies on teachers and technology. We also make suggestions derived from this model for the infusion of tech-nology into schools. To summarize the major themes, in order to understand why and why not teachers use technology, we must look at teach-ers as goal-oriented, purposeful organisms. PCT provides a comprehensive model for understanding technology infu-sion. From a PCT perspective three conditions are necessary for teachers to use technology: 1. The teacher must believe that technology can more effec-tively meet a higher-level goal than what has been used. 2. The teacher must believe that using technology will not cause disturbances to other higher-level goals that the he or she thinks are more important than the one being maintained. 3. The teacher must believe that he or she has or will have sufficient ability and resources to use technology. Zhao, Y. & Cziko, G.A. (2001). Teacher Adoption of Technology: A Perceptual Control Theory Perspective. 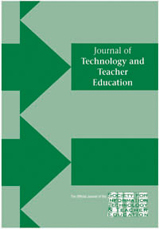 Journal of Technology and Teacher Education, 9 (1), 5-30. Norfolk, VA: Society for Information Technology & Teacher Education. Retrieved April 21, 2019 from https://www.learntechlib.org/primary/p/8455/. Bruce, B.C., Peyton, J.K., & Batson, T.J. (1993). Network-based classrooms . New York: Cambridge University . Charp, S. (1995). Editorial. T.H.E. Journal, 22(6) ,10. Cuban, L. (1994). Public schoolteachers using machines in the next decade (Contractor Report, Oct. , 8). Washington, DC: Office of Technology Assessment. Cuban, L. (1986). Teachers and machines: The classroom use of technology since 1920. New York: Teachers College. Education , W . (1997) . Techno logy coun ts: Schoo ls and re form in the in formation age . Washington DC: Education Week . Huberman , M . (1995) . Networks that alter teaching: conceptualizations , exchanges , and experiments . Teachers and Teaching: Theory and Practice , 1(2) , 193-211 . McKinsey , I. (1995). A nation of opportunity: realizing the promise of the information superhighway. A report prepared for the National Information Infrastructure Advisory Council (NIIAC). Means, B. (1994). Introduction: Usingtechnology to advance educational goals. In B Means (Ed.) Technology and educational reform: The reality behind the promise. San Francisco: Jossey-Bass. Office of Technology Assessment. (1982 , April 1-4). Information technology and its impacton american education. Washington DC: Office of Technology Assessment. Office of Technology Assessment .(1995) . Teachers and techno logy: making the connection. Washington, DC: Office of Technology Assessment. Olson , J . (1995) . Classroom ethos and the concerns of the teacher . In D.
Olson , J . (1992 ). Trojan horse or teacher(cid:146)s pet? Computers and the teacher(cid:146)s influence. International Journal of Educational Research, 17(1), 77-85. Schrum, L. (1995) Educators and the internet: A case study of professional development. Computers and Education, 24, 221-228. Veen, W. (1995). Factors affecting the use of computers in the classroom: Four case studies. In D. Watson& D. Tinsley (Eds.) Integrating information technology into education. London: Chapman& Hall. Wenglinsky , H. (1998). Does i t compute? There la t ionsh ip between educational technology and student achievement in mathematics (Research Report). Princeton , NJ: Educational Testing Service. Zhao, Y. (1998). Design for adoption: The development of a Webbased education environment. Journal of Research on Computing in Education, 30(3): 307-328. Have Pre-Service Teachers’ Technology Skills Changed in the Last 14 years? Teachers' Adoption of Technology in Classrooms: Does School Size Matter?